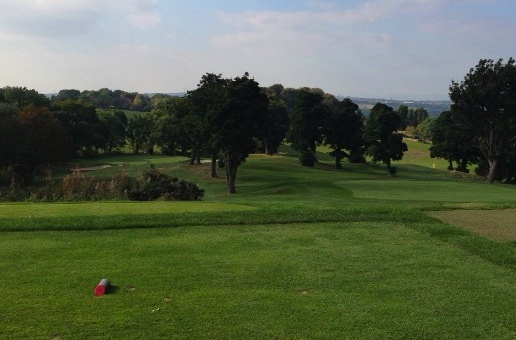 #19: Linlithgow Golf Club: On the tee with the Lady Captain! 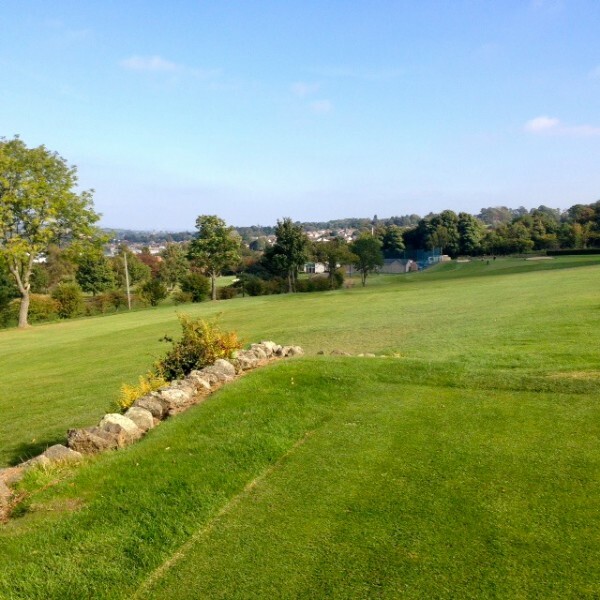 You are here: Home › Blog › #19: Linlithgow Golf Club: On the tee with the Lady Captain! 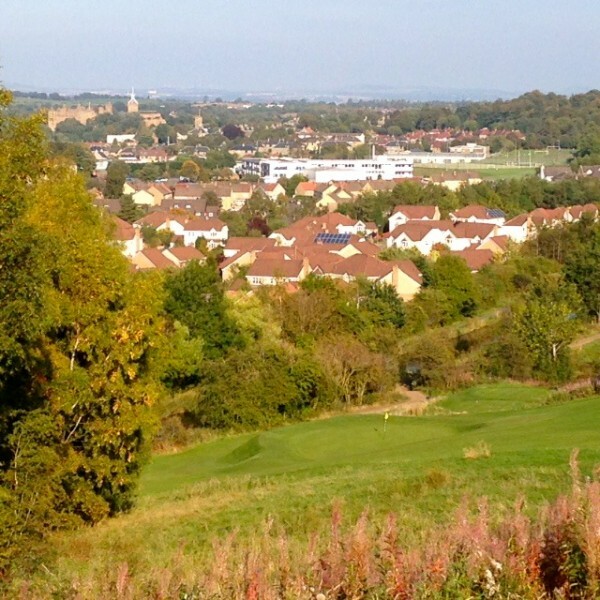 Linlithgow Golf Club is a special place, nestled between the Cockleroi Hill and the town. 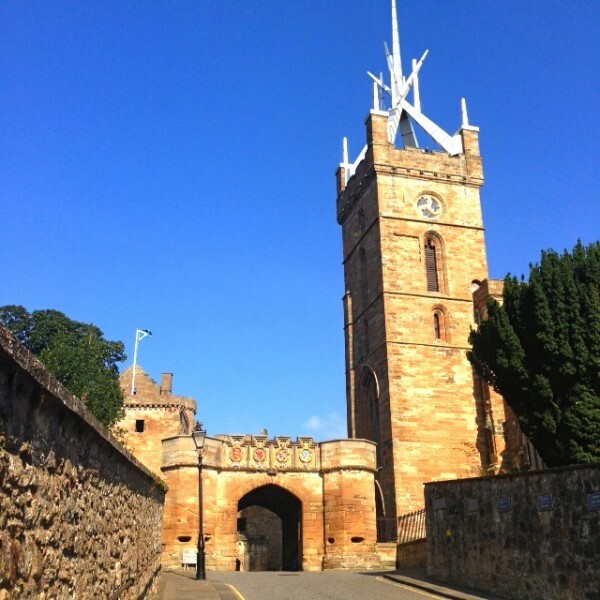 As the birth place of Mary Queen of Scots, Linlithgow the town has a remarkable palace at its centre. I arrived midday and knew the course was busy until later in the afternoon, so I went to see the palace first. Linlithgow Palace is situated in a beautiful park set beside a peaceful loch: fit for a queen! It was here on December 8, 1542 that Mary Queen of Scots was born. This was erected by her father, James V of Scotland. He and, his father before him, are responsible for a great many of the palaces and castles that we see today throughout Scotland. Linlithgow is just one example. 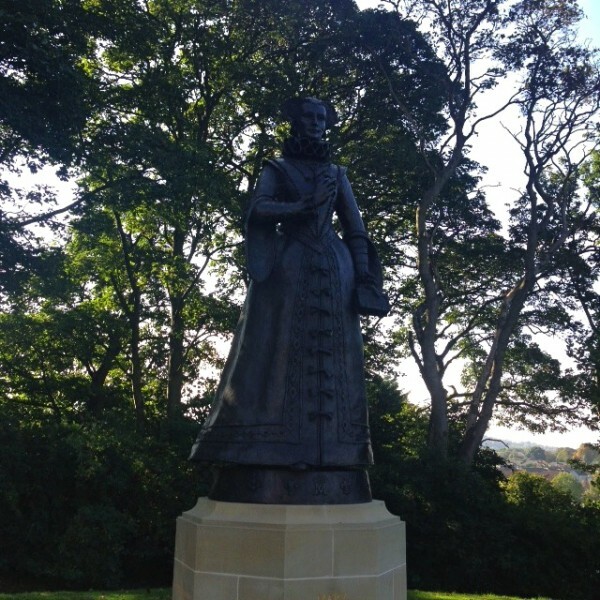 I have been to the palace a number of times; so today it was just the new statue I had wanted to see. 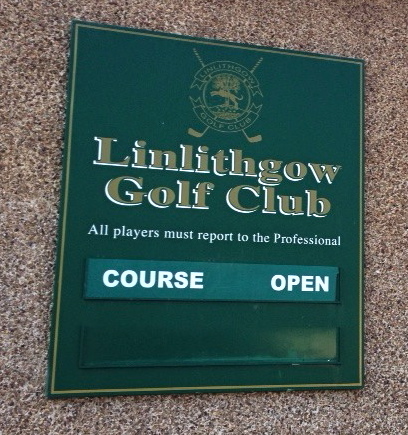 Linlithgow Golf Club it seems, has a special relationship with ladies: both those who play and those who do not seem to have stamped their mark on its history. To begin, Eleanor Fyfe, its current Lady Captain gave me an amazing welcome. I was just finishing my round and watched her hit a perfect drive down the first. She interrupted her own play in order to come over to welcome what she thought might be 'a new lady member.' I was really touched. And that same friendly atmosphere extends everywhere around the Club from the Pro Shop to the 'Gena McKinnon' Lounge in the clubhouse. And it really is an open and friendly club. 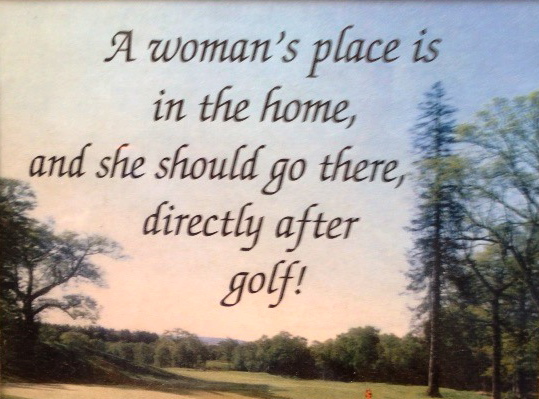 This 'Lady of the Links' could not agree more!! 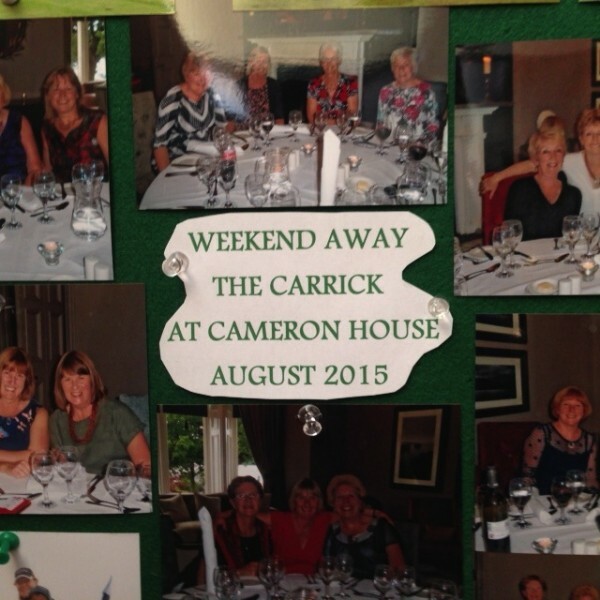 It also seems that the 'Ladies of Linlithgow' go on a couple of golf trips a year to somewhere around the country. Here is a picture from their event that they just had in August. It seems like they are an active group and enjoy their golf together as well! 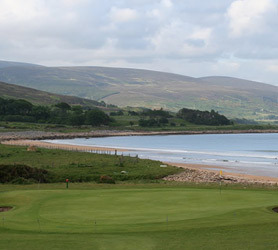 The course was opened officially in 1913. 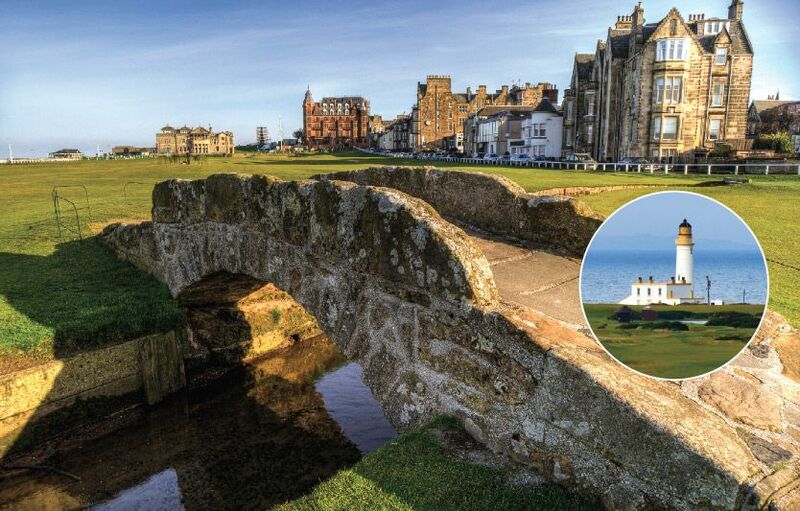 It had been originally designed by a Mr. Robert Simpson a professional at Carnoustie which explains why some of the holes are particularly challenging. I had read about the club history, and discovered that its existence had been helped by a couple of remarkable women. The first, and most important, being Mrs. Gena MacKinnon, of the Drambuie brand fame. 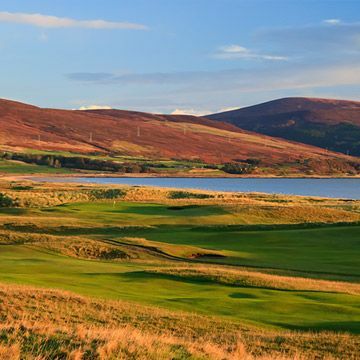 Mrs. MacKinnon did not play golf herself, but she came to the Club's rescue by leasing land at a nominal rate. It was she who cut the first sod to extend the course to 18 holes in the 1960's. 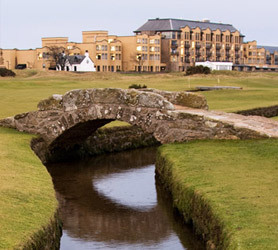 She opened the course each year and their lounge bar is called the Gena MacKinnon Lounge. Another remarkable woman, Mrs. Dorothy Stein, came to the rescue with a flexible loan at a time of crisis. In recognition of this, they still play today for a Stein Trophy. 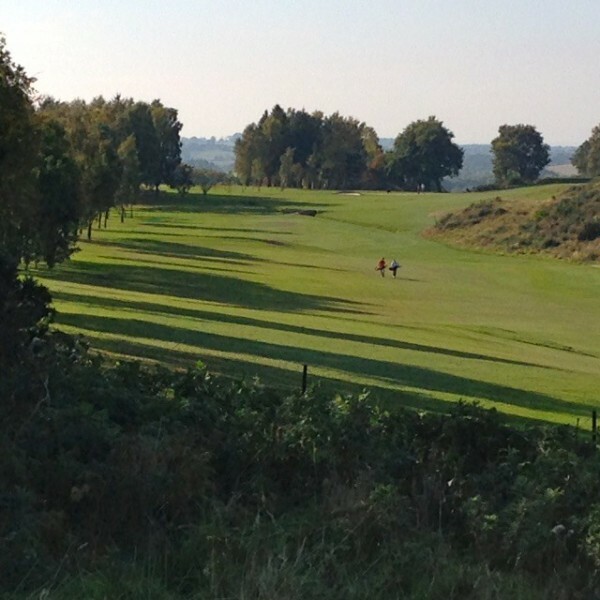 Possibly because of such dedication, from members and non-members alike, Linlithgow Golf Club truly is a stunning course with a great spirit. 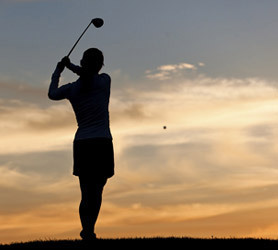 Its greens, fairways and in fact, the entire golf course, offers a stern, but fair test. It is in pristine condition, and it sits gently above the surrounding area, watching over all. before climbing up at the third, with the views becoming increasingly spectacular. 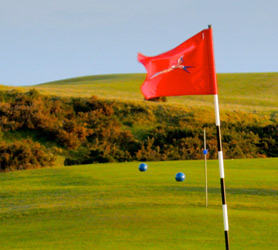 My two favourite holes were these two back-to-back Par 3’s on the 7th and 8th. I think this is the first time I had encountered such a feature. They are both challenging and fun. 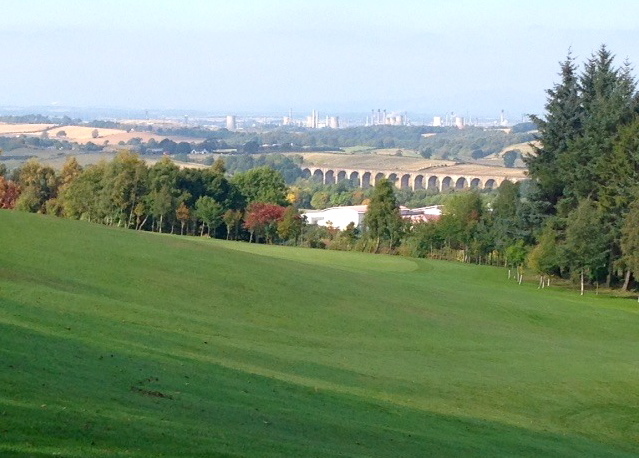 All the holes at Linlithgow Golf Course have someting to offer, and all have beautiful views. I was taking my time, so a couple of junior members cut in during my round. They were quite useful golfers! i was delighted to see them enjoying the course on a Friday evening. Cameron had said he thought the best hole was the 17th. It is a straight downhill drop as you can see here. And it's a real challenge! I hit a 'perfect' six iron which I thought was high enough to land and stick on the green: I thought wrong! It ended up on the bank below the hole and I had a very difficult chip back uphill onto the green. 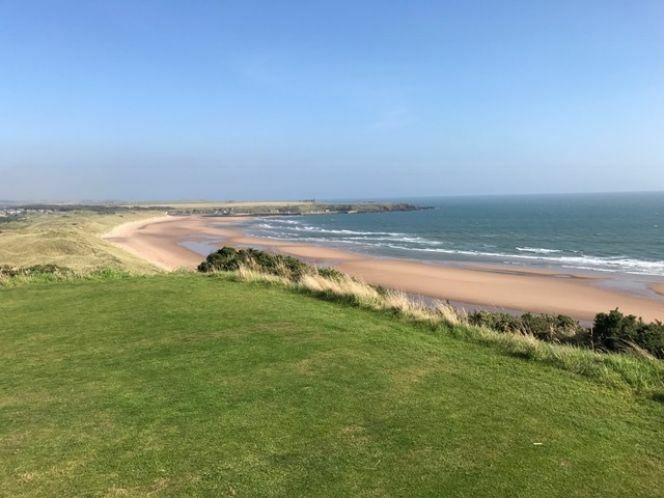 I was delighted to walk away with a five from where my tee shot ended up! The 18th runs parallel to the Union Canal. (It's a lovely tranquil finish after the tortures of the 17th.) 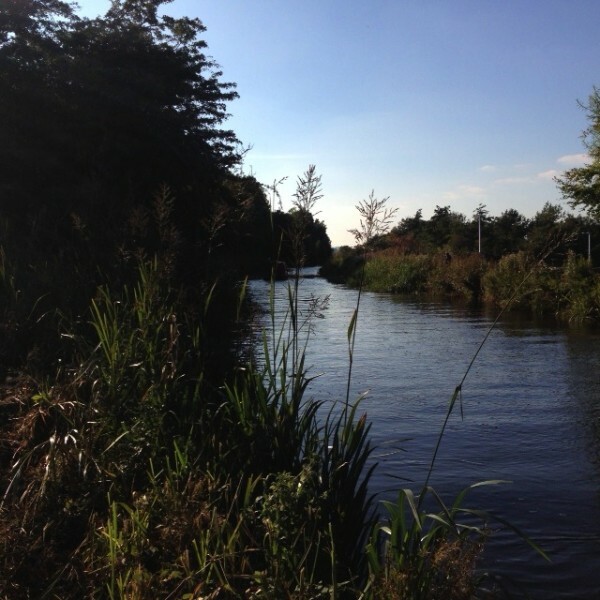 There were canal boats, runners, bikers and dog walkers enjoying this inviting waterway. The canal provides a gentle outline to the finishing hole. Thank you, Linlithgow, for such a wonderful round. See you again, as soon as I can! 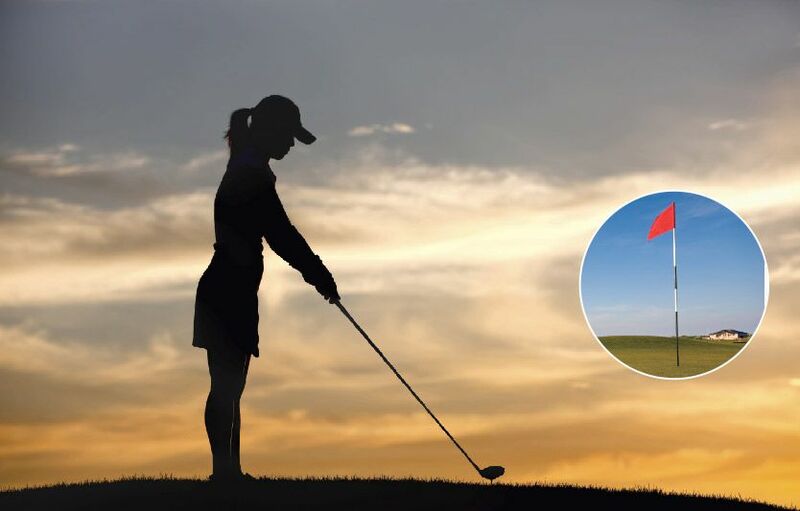 Golf Notes: The course is 5,858 yards so it is not exceptionally long. There are trolleys to hire as well as golf buggies.